If you follow me on twitter, read the few posts on this blog, or if you know me in real life then you know that I am quite interested in the Chinese app market. You can read the reasons for this interest in my Some thoughts on Mobile post. In short the main reasons for my interest are the numbers of people using Android in China (largest smart phone market in the world) and the way in which the ecosystem developed, mainly without Google Play as the central and de facto app store. I decided to try to learn more about the Chinese app market in the same way that I had taught myself different programming languages and techniques in the past: pick a project and try to build it. I’ve always found that I learnt the most when I actually had a goal in mind and then worked towards it. In this case it is a bit different, in order to learn about the Chinese market I will try to introduce one of my apps into the market and try to reach a certain level of success. Both goals are not that crazy, but wanted to set something that was attainable given that I am trying to do this in my spare time and I’m not really sure what is possible given legal and cultural differences. I chose to go for a money target as my first goal since I wasn’t sure how easy it would be to track the installs properly within China, and I will need to learn more about which analytics APIs work within the great firewall of china. Please keep in mind that I do not speak Chinese in any way shape or form. I only speak English and a wee little bit of Canadian French, so I will be relying on Google Translate for much of this project. To try to achieve this goal, I chose my latest app illuminate. This was the my latest app, and because of my interest in localized markets (including China) I was careful to put all of my strings in string resource files for easy localization. illuminate is monetized with AdMob ads (banners and interstitials) and was first released on January 25th, 2014. Up until the initial writing of this post on May 4th, 2014 it has only made $1.47 within China. This low number wasn’t that surprising given that it was not translated into Chinese and was only available within Google Play and the Samsung App store. The first step was obvious: translation, so I bit the bullet and got the strings translated into simplified Chinese via the Google App Translation Service. The translation cost less than $15.00 for both the store listing and the in-app strings and was ready in a couple of days. I was really impressed with the service and if this works I will use it again. I then uploaded the app to Google Play, Samsung’s app store, Amazon app store, and the 1mobile app store may 4th, 2014. I chose to add 1Mobile because I heard that it did well in China. 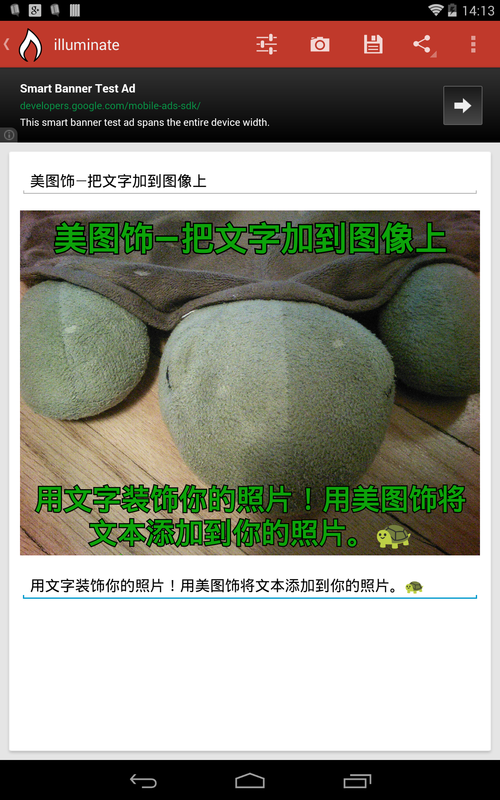 I also used a localized direct download on this blog (http://selsine.com/美图饰-把文字加到图像上/) because I had heard that direct app downloads are also popular in China. Illuminate is also listed on Xiaomi’s app store: http://app.xiaomi.com/detail/59840 but this was version 1.0.7 taken from Google Play and I’m not sure if it will be updated with the latest translated version. FYI: 美图饰-把文字加到图像上 is the translated name of the app: 美图饰 comes from “illuminate” and means “Mito Ornaments” or “Beauties Ornaments”, I honestly don’t really know what mito means or why it was translated like that but I put blind faith in the translation company and have assumed that it makes sense locally. 把文字加到图像上 comes from “text on phones” and means “The text added to the image”. I added that last bit (Text on photos) to my store listing to give people an idea of what an app titles illuminate would be for. I also setup a weibo (often known as the Chinese twitter) account and tweeted or weibo’d out the link to my app a few times. Now that I have the app translated my next step will to try to get the app listed on some popular Chinese app stores. I have heard that some Chinese app stores will take apps from Google Play and automatically listen them, but I can’t say for certain that this will happen. As I succeed or fail at this project I will track my progress on this blog. Next Next post: The Chinese App Market Project…Paused?